Cell death via FAS/CD95 can occur either by activation of caspases alone (extrinsic) or by activation of mitochondrial death signalling (intrinsic) depending on the cell type. The BH3-only protein BID is activated in the BCL-2-regulated or mitochondrial apoptosis pathway and acts as a switch between the extrinsic and intrinsic cell death pathways. We have previously demonstrated that islets from BID-deficient mice are protected from FAS ligand-mediated apoptosis in vitro. However, it is not yet known if BID plays a similar role in human beta cell death. 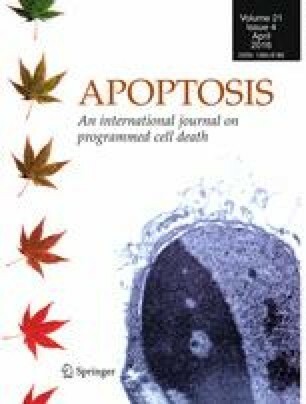 We therefore aimed to test the role of BID in human islet cell apoptosis immediately after isolation from human cadaver donors, as well as after de-differentiation in vitro. Freshly isolated human islets or 10–12 day cultured human islet cells exhibited BID transcript knockdown after BID siRNA transfection, however they were not protected from FAS ligand-mediated cell death in vitro as determined by DNA fragmentation analysis using flow cytometry. On the other hand, the same cells transfected with siRNA for FAS-associated via death domain (FADD), a molecule in the extrinsic cell death pathway upstream of BID, showed significant reduction in cell death. De-differentiated islets (human islet-derived progenitor cells) also demonstrated similar results with no difference in cell death after BID knockdown as compared to scramble siRNA transfections. Our results indicate that BID-independent pathways are responsible for FAS-dependent human islet cell death. These results are different from those observed in mouse islets and therefore demonstrate potentially alternate pathways of FAS ligand-induced cell death in human and mouse islet cells. We thank S Fynch (St Vincent’s Institute) for technical support, and Dr T Loudovaris and L Mariana (St Vincent’s Institute) for human islets. This work was funded by a National Health and Medical Research Council of Australia (NHMRC) Program Grant (APP1037321) and fellowships from the NHMRC (HET, APP1042735) and the Juvenile Diabetes Research Foundation (MVJ, 3-2011-352). The St Vincent’s Institute receives support from the Operational Infrastructure Support Scheme of the Government of Victoria. The authors declare no competing financial interest in relation to the work described. MVJ, PMT and AAH performed experiments, analysed data and critically revised the manuscript. MJV, AAH and HET designed the study and wrote the manuscript. TWK, WJH, PJO, AAJ contributed reagents, contributed to the conception, design and interpretation of this work and critically revised the manuscript. All authors approved the final version of the manuscript. HET is responsible for the integrity of the work as a whole. All procedures performed in studies involving human tissue were in accordance with the ethical standards of the institutional and/or national research committee and with the 1964 Helsinki declaration and its later amendments or comparable ethical standards. Informed consent was obtained from next-of-kin for all individual organ donors included in the study. All procedures performed in studies involving animals were in accordance with the ethical standards of the institution or practice at which the studies were conducted.